Artificial grass can give you a stunning landscape, without ever having to lift a finger or worry about water restrictions. But artificial turf isn’t just for beautification. Have you considered all the recreational possibilities fake grass can bring to your yard? Here’s one: look into artificial turf putting greens! Artificial grass putting greens for your home. Instead of working on your lawn or despairing over the muddy, bare spots or pet damage, you could be enjoying your yard — practicing to tighten up your chipping and putting game. Austin Artificial Grass’ synthetic lawns are soft to the touch, non-toxic, and hypoallergenic. Our installation provides extra cushioning, so you can be confident your yard offers a safe, healthy place for kids and adults to enjoy some golf. Isn’t it time you had an artificial putting green? Our Austin Artificial Grass professional designers can help you use artificial grass to transform your back yard into a golf paradise. 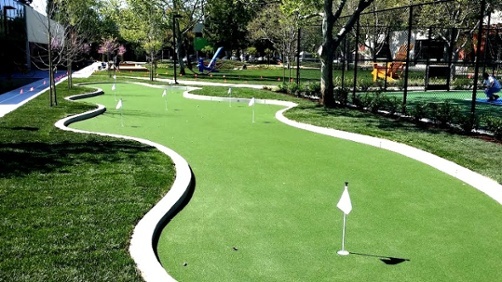 We also offer putting green installations for businesses and other commercial projects! Artificial grass bocce ball courts by Austin Artificial Grass provides turf that stays sturdy and smooth. Though natural-feeling to the touch, our artificial turf is durable enough to handle everything from pets to sports. Artificial turf dries more quickly and drains much faster than real grass, preventing water from pooling on its surface. This way, your bocce court will dry more quickly, and play will be less affected by rainy weather. It’s also cleaner! The mess of gravel, mud and grass stains is eliminated with our artificial turf bocce courts. No matter the season, your artificial grass bocce court will provide a beautiful, inviting option for you and your family. 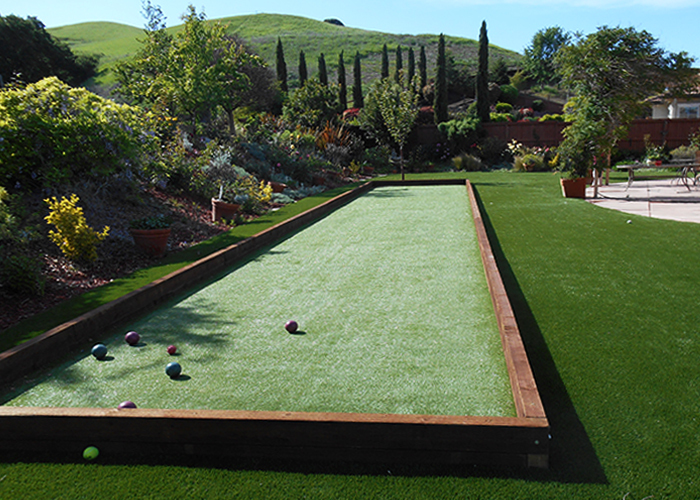 We can install our artificial turf bocce courts on most surfaces.